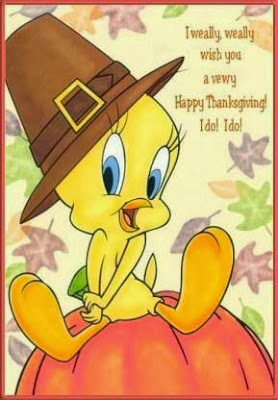 Happy Day After Thanksgiving Day, readers! Are Home Sewers Unusually Cheap? 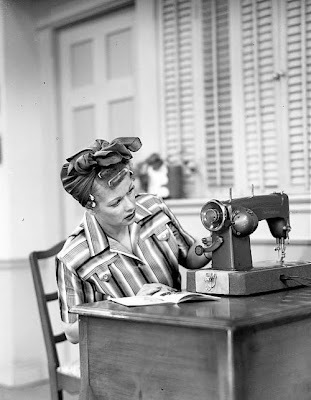 Friends, a few weeks ago I found myself engaged in conversation with a prominent professional member of the sewing community. 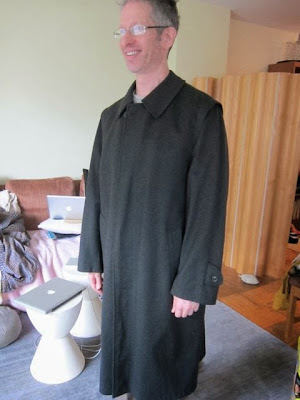 Readers, my pea coat is finished and you can see me modeling it RIGHT THIS VERY MINUTE over at the Mood Sewing Network. 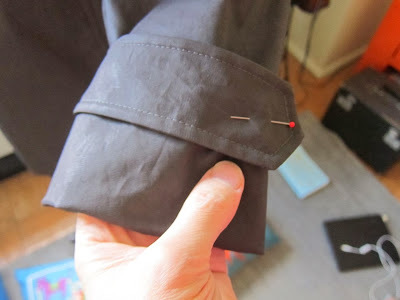 Readers, I CANNOT believe how long it takes to make a pea coat. If I ever tell you I'm making another one of these, sit me down and talk some sense into me. 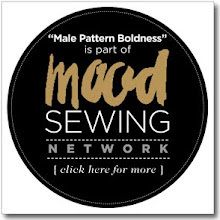 My Interview with Sarai Mitnick of Colette Patterns! 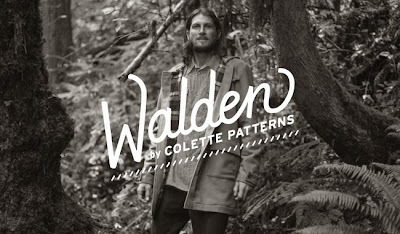 Readers, last week's post about Colette's pattern branding got me wondering more about what it's like to be an independent pattern maker. The pea coat is coming together slowly. 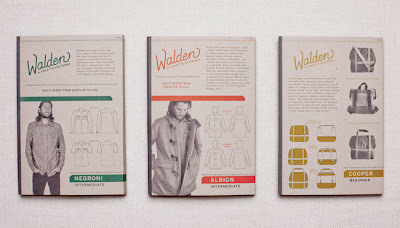 Pea Coat Progress + New Patterns! 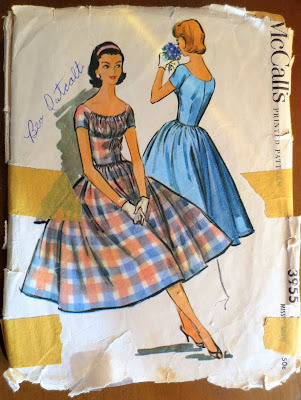 Readers, be honest: do you think this McCall's pattern I just purchased, which dates from approximately 1957, is too Sixteen Going on Seventeen for my cousin Cathy? 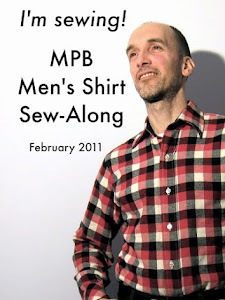 Let's get back to the pea coat project. 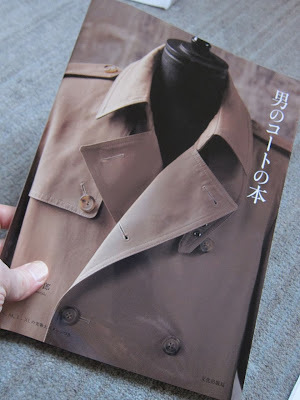 As you'll recall, I'm making my coat from the Japanese men's coat pattern book up top. Japanese TV wants to interview ME? 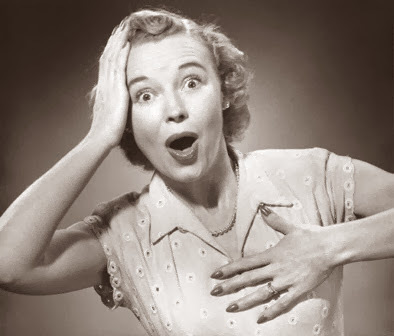 ZOMG, readers -- you won't believe how I spent yesterday! 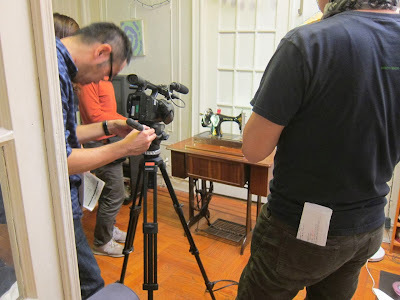 About a month ago I'd received an email from a producer at Japan's Nippon TV network, saying they were interested in doing a short (2 1/2 minute) segment about vintage sewing machines. They'd discovered my blog and were wondering if they could do an interview. Readers, today I want to talk about branding. 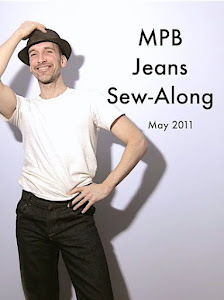 I spent most of today gearing up for my pea coat project. 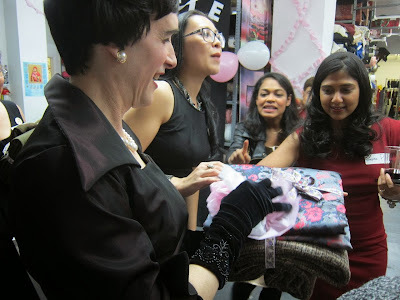 What Cathy won + my pea coat fabric choices! 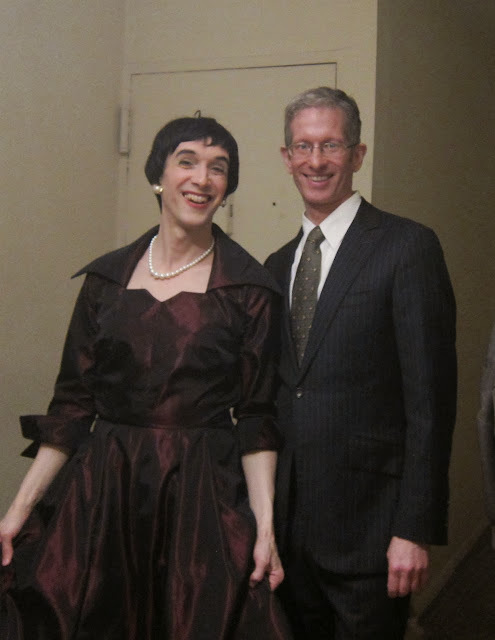 You may have heard that Cathy won Friday night's Little Black Dress contest at the Pattern Review anniversary party, held at Elliot Berman Textiles. With a little help from you-know-who. 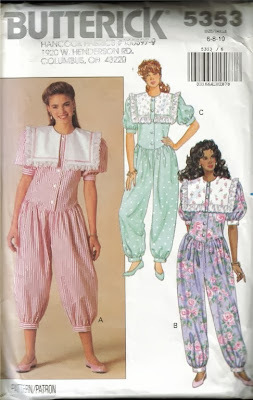 The 1990's Balloon-Pant Jumpsuit -- YEA or NAY? 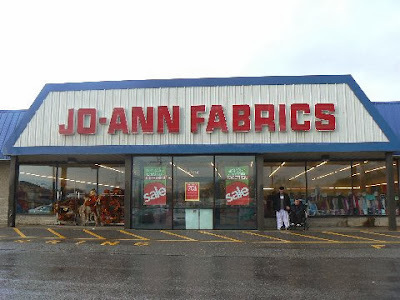 Readers, what do you call it when something you consider utterly unremarkable suddenly becomes the new nostalgia? Labels: 90's glamour, YEA or NAY? 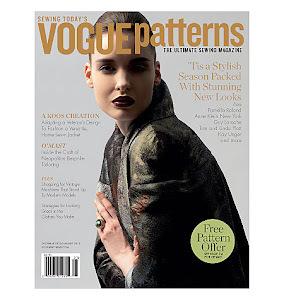 Cathy's Photo Shoot from the Pattern Review Anniversary Party! 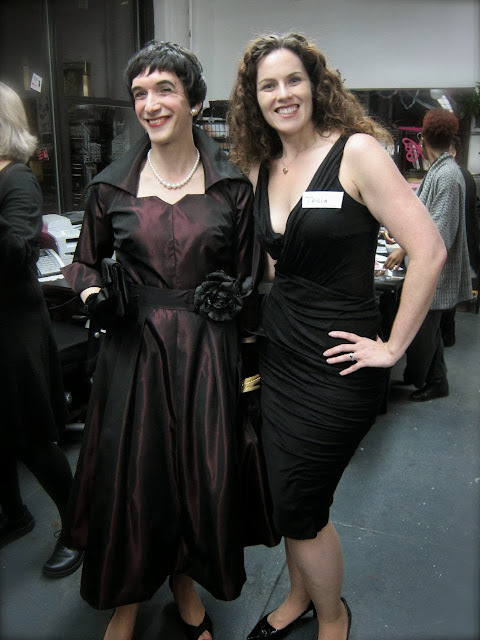 What a lovely night Cathy had at the Pattern Review Anniversary Party held at Elliott Berman Textiles yesterday! We're getting down to the wire, people! 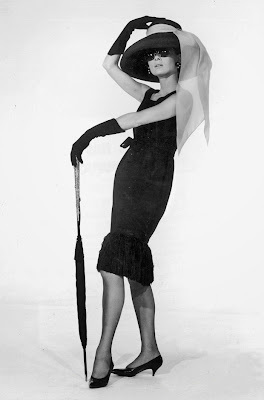 There is still a great deal to do before this LBD is done, and I have less than twenty-four hours to do it. I need to insert a lapped side zipper. I need to attach the sleeves. I need to stitch down the neck facings and cuff facings. 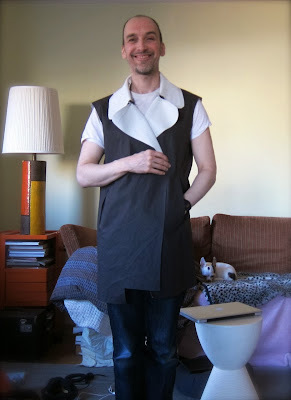 I need to hem a very wide skirt. And then there's Cathy's hair! I know I sound like an old fart, but sometimes I look at photographs of today's celebrities and I think, Who are these people? We Interrupt This Blanket Coat or "LBD By Friday?" 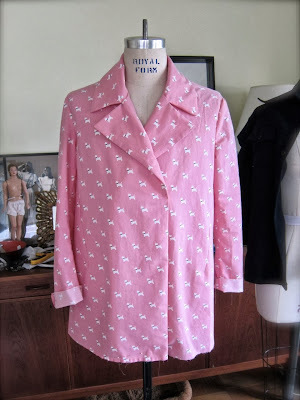 I can't get this vintage blanket coat/jacket project off my mind, readers, so permit me to brainstorm a bit. 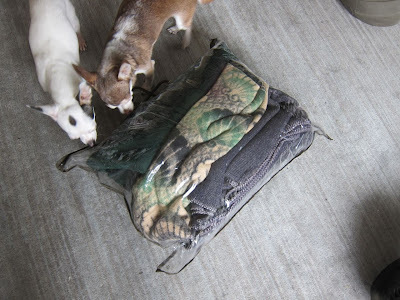 Camp Blanket Bingo! 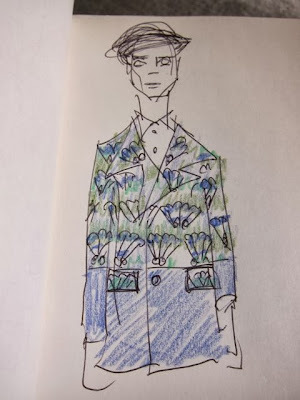 + A Color Blocked Pea Coat? Friends, I simply must share with you what followed me home from the flea market this morning.